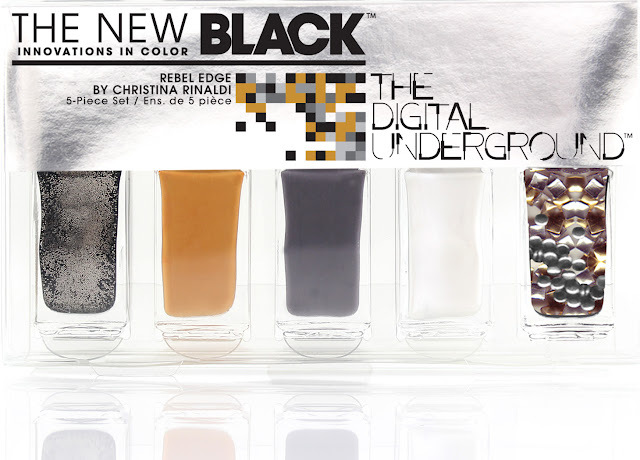 If you're unfamiliar with The New Black, they started a little while ago with ombré sets and are now available worldwide, offering a wide variety of nail art set, from studs to nail art liners or newspaper kits... They even released a few collabs with famous nail artists such as Madeline Poole and Christina Rinaldi! So today I have a skittle studded nail art to share with you, from their Christina Rinaldi Digital Underground Rebel Edge set. The Rebel Edge kit consists of 4 nail polishes and a studs set : black with gold glitter, slate grey, tan crème, pearly white and a mix of silver/gold studs plus rhinestones. Well that's it for today, I hope you liked this post. I just got the "Noble Spirits" set. I like all the polishes except the green is a bit sheer. I wasn't expecting the polishes to be so small though! I haven't got it but it looks so tempting!! I like the design you made on beige and gray!! Wow, such a beautiful mani!